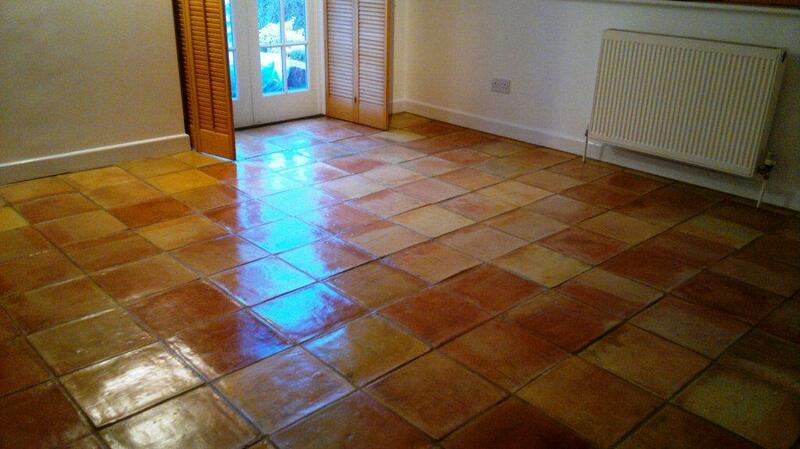 This Terracotta tiled floor was installed in the dining room of a house in Andover and as you can see from the photograph below the floor had not been maintained very consistently and was now well overdue for a complete strip, clean and reseal. To get the floor clean and remove previous sealers and coatings I mixed a strong solution of Tile Doctor Pro-Clean with NanoTech UltraClean which basically adds tiny abrasive particles to a heavy duty alkaline cleaning agent to produce a very effective stripper/cleaner which being alkaline is ideal for cleaning natural products such as Terracotta. This formula was scrubbed into the tile using a black scrubbing pad fitted to a rotary machine running on a slow speed which helps to reduce splashing; this activity soon brought the dirt off the floor and the soiled cleaning solution was removed using a wet vacuum and the floor was rinsed down with clean water. The cleaning process was repeated a couple of times until we were happy with the floor, a stiff hand brush was then used along the grout lines with more Pro-Clean to clean up the grout. There were a few stubborn paint splashes on the floor and these were removed by spotting the affected area with Remove and Go and a steamer to lift the stain out of the clay. Once happy the floor was clean it was given a thorough rinse to neutralise it and remove any remaining chemical and left it to dry overnight. The next day we came back to seal the Terracotta using numerous coats of Tile Doctor Seal and Go which is an ideal sealer for Terracotta and provides durable stain protection together with a low sheen finish. Terracotta is by its nature very porous and so it’s not unknown for it to take up to nine coats of sealer, which can take some time to apply as like paint you have to wait until it’s dry before you can apply the next coat. 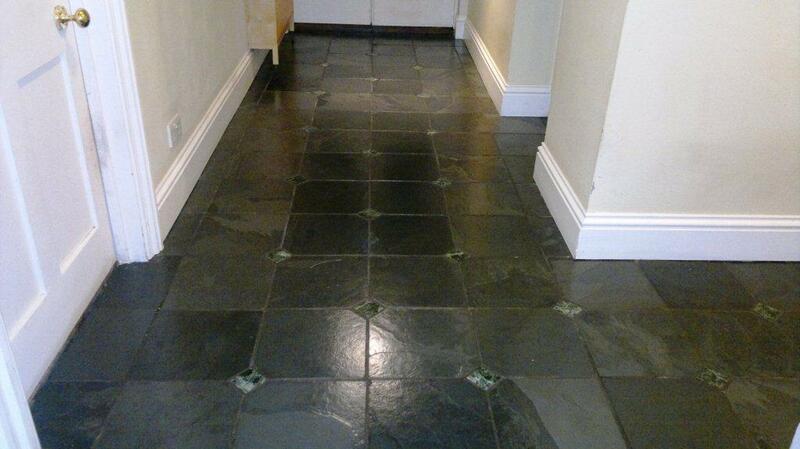 The owners of this house in Southampton called us in to breathe some life back into their slate floor which had become rather dull and had lost its shine. We took a look and could see the previous sealer had been worn down and it was in need of deep clean and re-seal, sealers will wear off over time and once they are gone dirt will start to get trapped in the pores of the tile. 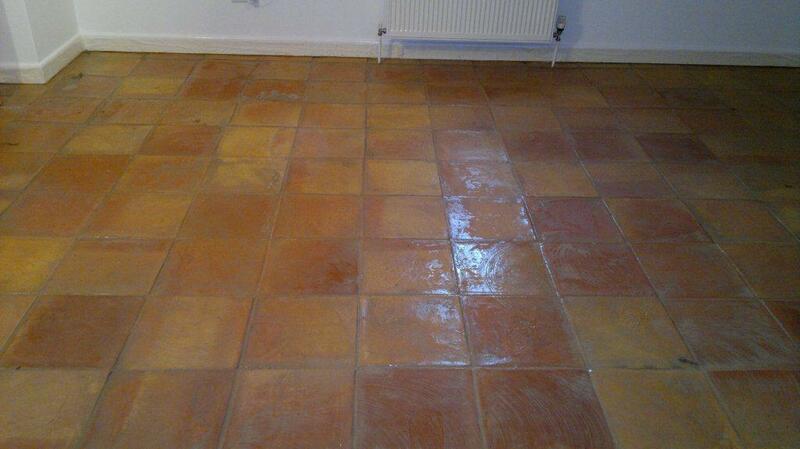 To remove any remaining sealer and give the floor a deep clean we applied a strong dilution of Tile Doctor Pro-Clean. This was left to dwell on the floor for a while before using a rotary machine fitted with a black scrubbing pad to scrub the floor and get the slate floor really clean. The machine can struggle to reach the grout so it was necessary to get in with a stiff hand brush afterwards and scrub along the grout lines. Once I was satisfied with the condition of the stone floor it was given a wash down with clean water which was removed using a wet vacuum to make sure no chemical was left on the floor as this can affect the sealer later. 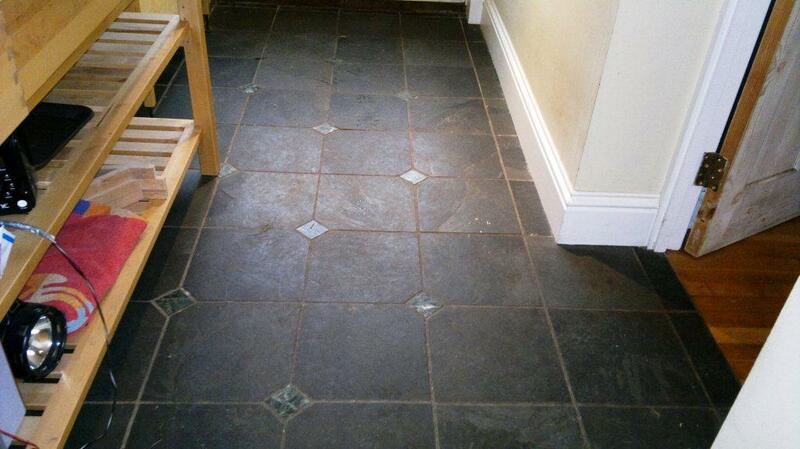 Sealing the Slate floor was a straight forward process once the floor was clean and free of any debris etc. The sealer chosen for this floor was Tile Doctor Seal and Go which adds a low sheen finish whilst providing stain protection. Five coats were applied using a paint pad applicator before the floor was fully sealed , the number of coats you need depend on the porosity of the stone and each floor is different and you need to let each coat dry before proceeding to the next.